Why you should be watching iZombie! I know it’s been awhile but I’m working on getting back in the swing of things and plan on getting more posts up on this here bloggity blog. Last month, I attended Wizard World Comic-Con Chicago and I promise to have those pictures up very soon. First, I must write about my current obsession. One that I want to pass on to you so that perhaps you too may become obsessed with my obsession. This obsession comes in the form of a CW program entitled iZombie. iZombie, a show loosely inspired by the comic of the same name, centers around the life of the recently zombified Oliva “Liv” Moore as she attempts to navigate her new undead life and the various social and physical difficulties that come along with it. Let me share with you a few points as to why I’m so entertained by iZombie, and perhaps I can help you determine if iZombie is right for you! (I feel like I should include a list of side-efftcts after that statement but I’ll just go ahead and move on to the (brain)matter at hand). The hot sauce will make more sense later. Olivia “Liv” Moore is your average working zombie who chooses to procure her brain food the “ethical” way, via her job at the morgue rather than munching on an unsuspecting populace. However, this new diet makes for interesting complications because in this world, zombies are the lucky recipients of visions every time they eat a brain, which makes for an uncomfortably close connection with their meals. Furthermore, not only do we witness as Liv vividly experiences moments of the deceased’s life (and often death), but she typically acquires the more dominate personality traits and skills of the unfortunate victim. This often leads to some humor heavy scenarios or scenarios that are just plain heavy. More often than not, each episode deftly juggles the two. iZombie, in this regard, filled the void I had been feeling since Buffy the Vampire Slayer ended its run. Though nothing can ever quite replace Buffy, iZombie shares many similarities in how it handles both the serious and the silly within a fairly macabre setting. Rob Thomas and Kristen Bell at Paleyfest. Veronica Mars wasn’t a show that I watched while it was on the air. Once I did, I gave myself a good swift mental kicking on missing out on such a wonderfully well written show for so long. If you are a fan of Veronica Mars but fear the horror/sci-fi elements of this show will lose you, fear not! Rose McIver does an excellent job portraying Liv and it’s not hard to see similarities between her and Ms. Mars. Rob Thomas gives us an excellent female lead who despite her zombie state, is smart, confident and funny. David Anders is my boyfriend one of those actors who has probably popped up at one point or another in a show that you’ve watched. He got his big start as the villainous Julian Sark on Alias and went on to do recurring roles in Heroes, The Vampire Diaries and Once Upon A Time as well as having made appearances on 24 and Arrow. 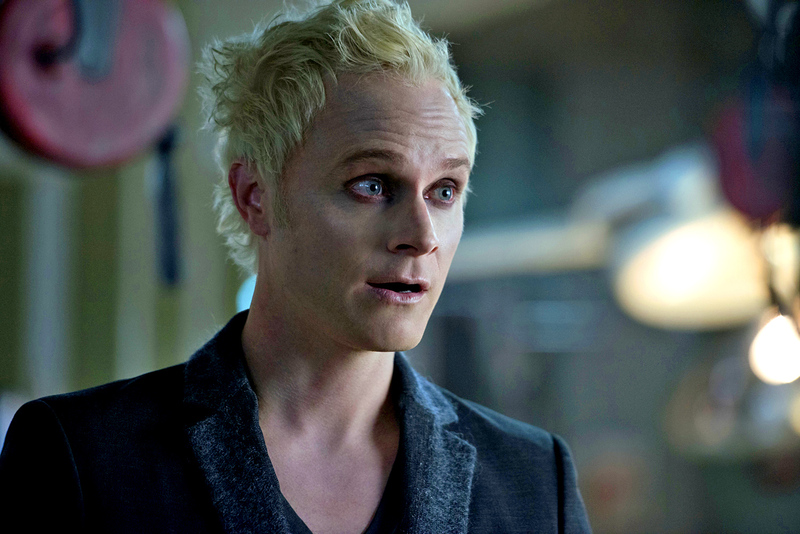 In the world of iZombie, Anders’ job is to basically chew up the scenery like nobody’s business as the cruel yet cool zombie entrepreneur Blaine DeBeers. Fans of Buffy the Vampire Slayer‘s Spike might be interested in the blonde baddie for he too is the type of charismatic villain you love to hate (or maybe just love). Season 2 will surely see some interesting obstacles for our charming villain but I won’t spoil that one for you. While I know in the grand scheme of things, this isn’t necessarily the most important aspect of a television show, I appreciate the effort of a unique title sequence. This one pulls from the show’s comic origins while also giving us a memorably catchy theme song “Stop, I’m Already Dead” by Deadboy and the Elephantmen. Additionally, as we return from commercial breaks, each act of the show is prefaced with a comic style image screen and title. Much like Buffy the Vampire Slayer, the ensemble cast of iZombie compliment each other wonderfully with each member bringing something special to the table. Often times while watching other shows, I’ll find myself wishing that a character would be written out or killed off entirely but a small tear forms at the thought of losing any one of these characters. Season 2 of iZombie will premiere on October 6, on the CW. Season 1 is currently available for purchase digitally but will also be available September 29 in DVD format. You can also currently watch a handful of episodes via Hulu. Here’s hoping I helped sparked your interest in iZombie. Are there any shows out there right now that you feel are extremely underrated? Share in the comments!